Training and promoting adolescents are a key concern for us. We therefore offer several possibilities of experiencing our company, personally and first-hand. In cooperation with Kunststoffnetzwerk Franken e.V. (KNF) we visit schools in the region in order to give the pupils an impression of plastics engineering in general, our company and the specific training professions. We are also glad to show you our products in the framework of smaller exhibitions – both granular plastics as well as the components produced from them by our customers make plastic engineering a real experience. Do you want us to come to your school as well? E-mail us or call us. We are glad to welcome your school classes here in our premises in Burgbernheim to introduce plastic engineering to your pupils. 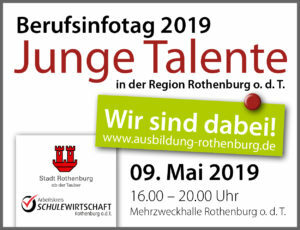 Please contact us – also on regional vocational training fairs, the job information day of the city Rothenburg ob der Tauber, the job information evening of Christian-von-Bomhard school in Uffenheim, or the education fair CONTACT in KKC Bad Windsheim. During the apprenticeship and training in our company, we also offer the possibility to acquire additional qualifications. An example for that is the KNF trainee seminar: Apprentices and trainees from various disciplines work together on a project or have the opportunity to get to know another company for a period of four weeks. As a Process Mechanic we expect you to bring enthusiasm for technologies and machines. Our products are what makes us so special. Packaging, labelling and controlling of our materials. This is where facts are created: Measuring, analysing and developing plastic materials. As laboratory technician you will learn how to think like a scientist. As Industrial Clerk you will contribute to all commercial matters of an industrial company. Organising trade fairs and events. As Specialist for Warehouse Logistics you are responsible for the flow of goods – on the PC and in the warehouse. Providing raw materials for the production. Digitisation is not foreign to you? Then you will be happy as IT Specialist: You are responsible for the support and administration of computer systems and networks.